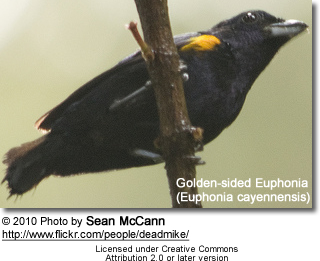 The Golden-sided Euphonias (Euphonia cayennensis) occur naturally in southeastern Venezuela (eastern parts of the state of Bolívar), through Guyana and French Guiana (the Guianas), Suriname, and northeastern Brazil from Manaus east (on both sides of the Amazon river) to the northern state Pará and northern areas of the northeastern state Maranhão. They inhabit subtropical and tropical moist lowland forests. Euphonias are known for their almost constant singing, and since they typically remain high in the canopy, they are more often heard than seen. Their calls sound like "see-see".